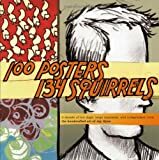 Jay Ryan's collection of indie rock show posters, 100 Posters, 134 Squirrels, is as beautiful a book as it is insightful into his work. The posters are beautifully reproduced, and often rough sketches sit beside the final show posters. Occasionally Ryan writes a short introduction to the posters, and these asides are worth the price of the book alone. My next book is Dirk Jamison's memoir, Perishable.